My Philosophy is that you should always be attempting to be the best Version of yourself. I spent years of my life being overweight, depressed and not living my life to the fullest. I worked in the Retail industry for 11 years whilst studying at college working part-time up to Senior Management in my final years which i believe gave me confidence and people skills i have now. Whilst Training in Management i went through a dramatic lifestyle change and lost 7 stone and fell i in-love with fitness, exercise and Nutrition. 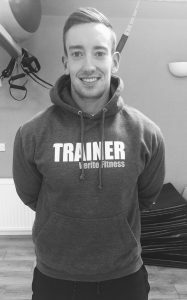 This became such a passion for me I then decided to follow this passion into a career, where i became a Qualified Personal Trainer while working at Verite fitness gaining knowledge and experience which has now led me to be the Head Trainer. How did i lose 7 stone? Those 5 words don’t really do justice for how hard physically and mentally it is, when you have been inactive and eating the wrong foods for most of your life! First thing you have to realise is YOU got yourself into the position you’re in and only YOU have the power to change. Second is set a goal, mine was to fit into a small shirt id purchased from my workplace. You need to do the same set a goal weight you want to get down to and a timeframe, this will keep you accountable and motivated to achieve said goal. I got myself a full time job which forced me to move more, I prepped food to take to work instead of wasting my money on takeouts. Then i began cycling to work and home also upping my daily activity therefore BURNING MORE CALORIES ? If i needed to snack because i was uncomfortably hungry i ONLY snacked on fruit. I began drinking water by the litre which kept me fuller for longer in between meals and most importantly kept me hydrated and full of energy. I didn’t take ANY supplements whether it be weight loss pills, weight loss shakes or buy any Dieting cookbooks. Everyone knows that Fruit, Veg, white meats and ground grown carbohydrates are healthy so that’s what i based my food on. I kept by meals simple with foods i liked to eat and then allowed myself a treat at the end of the week. I kept track of my weight by monthly weigh-ins and simpy the fit of my clothes, my goal was to fit into a small t-shirt i bought from my workplace and eventually i did.